That is what I saw in my facebook timeline from a post shared by a friend. After a few seconds looking at the equation, I was able to move one match and correct the equation. I was satisfied, it felt good. Then I wanted to share the question with our team. At Office Divvy, we have a message thread where we ask these types of “brain gymnastics” questions to the whole team. I posted the question on that internal thread, and was surprised to see that within a couple hours the rest of the team came up with another four ways to fix the equation by moving just one match! Nobody got all five possibilities by themselves. Some were able to see two ways, others three. But all combined, the team came up with five ways to answer this question correctly. Yes, together, we made the equation right, five different ways, by just moving one match stick. This reminded me another experiment we did back in April 2015. As we do every year, we were running our annual Jelly Bean guessing contest at that time. That year, one of our clients suggested we use that contest to see whether group knowledge fares better than individual knowledge. When we analyzed the contest entries, we found that the average guess of the entire group did not beat one individual’s, the winner’s guess. So we concluded group knowledge doesn’t always beat individual knowledge. Here’s the blog post from that experiment: Individual Knowledge vs Group Knowledge. However that was a pure guessing game. Here, we had a math equation, something definitive. Here, the superiority of combined knowledge of a group could truly shine, by far exceeding any individual’s performance. There are many learnings here. But one important learning is this: Draw your team, your colleagues, your peers, your supervisors or subordinates into problems. You’ll be surprised with the number of solutions you can find together. And, okay, going back to the equation. 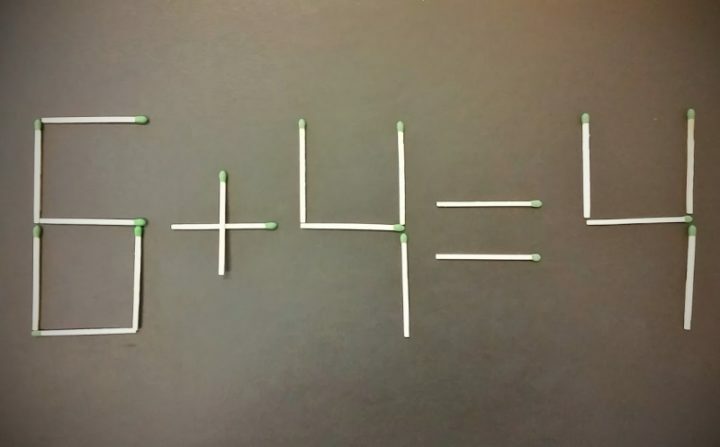 Now that you finished reading this post, go ahead and try to find all five ways to make this equation right by just moving one match stick. If you can’t do it alone, bring it to your team or group. Let’s see if you can match the Office Divvy team’s performance? Or perhaps, you can even find yet another way, a sixth way to do this right. And if that’s the case, and if you want to have the bragging rights for being a genius, go ahead and put a comment at the bottom of the page below, or reach out to us on the Office Divvy facebook page. Remember though, no cheating, no gimmicks, this has to remain as a valid mathematical equation with numbers on each side of the equation.